Painting, in opaque watercolour on paper, the portrait is of a young prince facing right with his hands crossed in front of him. He stands on a dark green ground which rises in a lighter shade to a high horizon where it melds with the blue brush strokes of a suggested sky. The man has a yellow halo with an outer band of gold denoting his royal birth. He wears a purple and gold turban with a sarpech and jewel attached to the front. He also wears ropes of pearls with gem-stone pendants across his chest and pearl bracelets. He is dressed in a striped purple and gold fur-trimmed coat with three-quarter length sleeves over a bright red jama. 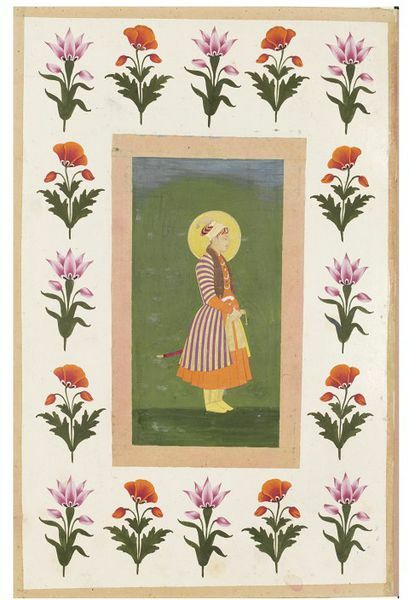 He has a gold patka and yellow boots decorated with gold foliated designs. The white hilt of a dagger is seen protruding from his patka at his waist and the end of a purple-coloured sword sheath is visible sticking out behind him. The painting is framed with plain strips of collaged buff-coloured paper on a ivory-coloured ground which is decorated with a row of alternate poppies and lilies without the gold outlines and detailing seen on the borders of other pages in the album. The page is edged with buff-coloured strips of paper with an additional beige-coloured strip on the right hand side to act as a gutter for the album binding. The edges of the page have been gilded. 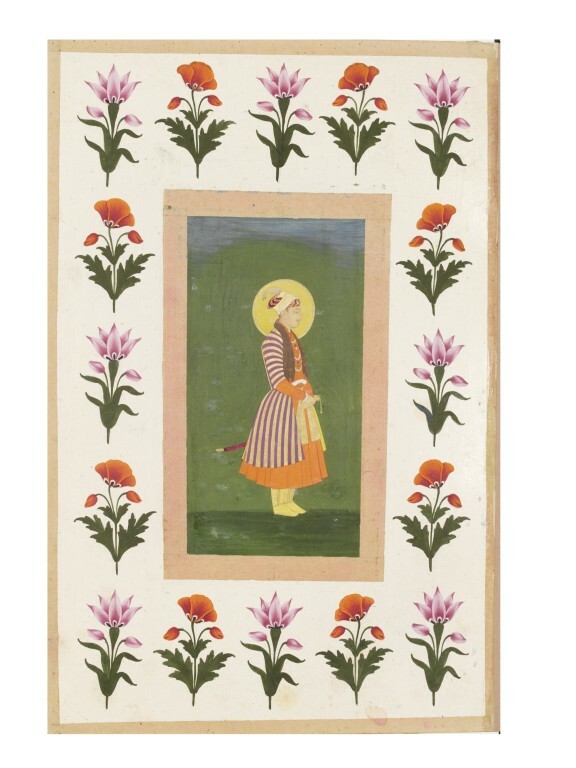 This miniature painting is part of the Small Clive Album of Indian miniatures which is thought to have been given by Shuja ud-Daula, the Nawab of Avadh, to Lord Clive during his last visit to India in 1765-67. 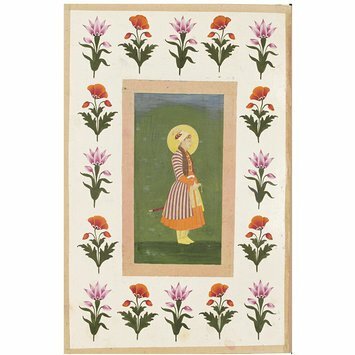 It contains 56 leaves on which are Mughal miniature paintings, drawing and flower studies on both sides. The binding is covered with an Indian brocade. Attribution note: The lack of patterned decoration on much of the figure's costume and halo suggests that this painting is in an unfinished state.